2016 update: funny how unpredictable comets are. Fun to look back at this and see how far off some of it was. You are probably aware that it is the year 2013 and possibly aware that comets are a thing, but you may not know just how cometous* this year is going to be. When I was a kid, we were told that the 1986 visit from Halley’s Comet would be the one great comet we would ever get to see in our lifetimes. This was the first time in my young life I was ever given something concrete against which to measure my own mortality. I was kind of bummed about it at the time. We knew it wouldn’t return until 2061, but it freaked me out to see I date on paper I might not see in life. The good news now is that all those jerks were wrong! Well, about the comet anyway. A tapestry from 1066 showing Halley’s Comet and some Normans getting ready to invade England. I suppose that this post deserves a short reminder of where comets come from first, so here we go. I’ll try to keep it simple. There are a LOT of comets. BILLIONS of them. Probably. 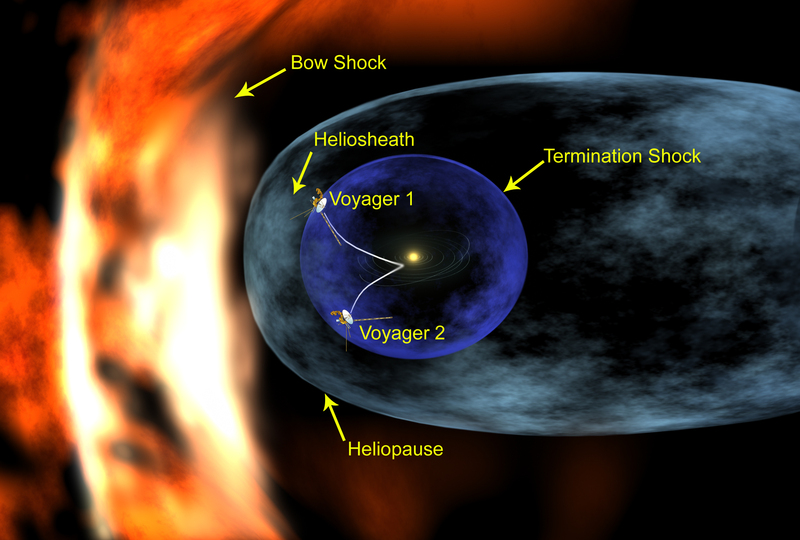 Of all the things in space that have names, my favorite name of a thing is the “Termination Shock“, which represents one of the main boundaries of our sun’s influence. Beyond (and within) this boundary lies my second favoritely names space thing: The Oort Cloud. This is were the comets live and while theoretical, it’s generally accepted that it’s out there. Since comets aren’t that big (it varies, but probably not much bigger than 20 miles across at most), they’re orbiting at a great distance (WAY beyond the orbit of Pluto) and the region we’re talking about is friggin’ enormous, we can’t directly observe them. Even several billion comets forming the cloud isn’t enough to make it seem much more than very tenuously populated. Space is really a very big place, even within/around our solar system. Every once in a while, however, one of these comets’ eccentric orbit brings it a bit closer to the sun and becomes more noticeable. 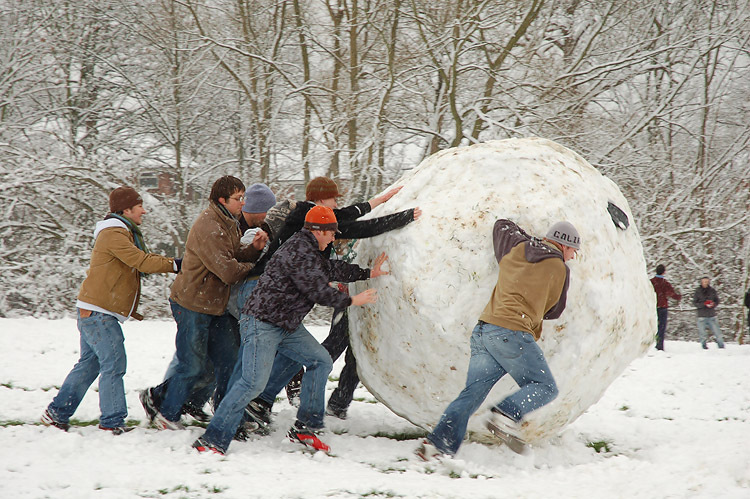 If you’ve heard about comets before, you’ve probably heard the term “dirty snowball” used to describe them, which pretty much sums it up, if you make your snowballs out of dust, bit of rock, methane and ammonia. I know I do. 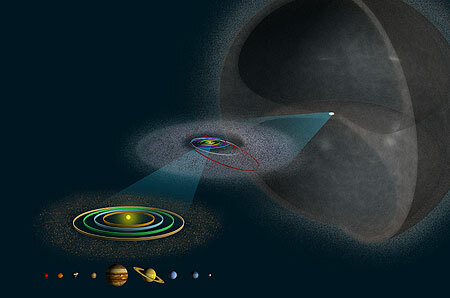 As the comet is warmed by the sun, some of the components of the comet start to liven up, vaporize and vent out into a cloud (coma) around the core of the comet (nucleus), which can then be blasted away by the solar wind to form a tail, which is what we typically think about when we envision a comet. Because this is how the tails form, the tail will always point away from the sun and not simply trail behind it as it moves through space, which can go against our intuition. They come in all shapes and sizes, but seem to often resemble peanuts. All of this leads to comets being discovered when they get close enough to become visible. Some (like Halley’s) do this for us regularly, as dictated by their orbits. The tricky thing is that the orbital periods of other comets are horrendously long. The smaller orbited ones we call “short period” comets and their orbits take less than 200 years. Halley’s Comet (at 75 years) is on the quick end of this scale, the furthest it gets from the sun (aphelion) being a bit past Neptune. “Long period” comets can have orbits that take thousands years, but can easily be hundreds of thousands or even millions of years. This means there are likely comets that were visible from Earth before there were any humans to see it and won’t be back until long after we’ve been eradicated or enslaved by our robot overlords. But for now, we know of two that promise to put on a show for us this year. 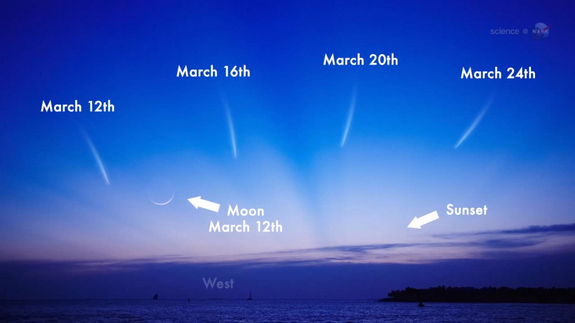 The first is called PanSTARRS (or C/2011 L4) and will be visible to the northern hemisphere next month. If you live in the southern hemisphere and have binoculars or a small telescope, you can see it now, but here in New England, we’re going to have to wait until the latter half of March. Currently there’s some debate about just how visible it’s going to be, but it’s probably going to be the kind of thing you’ll notice just after sunset and think is pretty neat, but nothing that is likely to create panic in the streets. You know most people will simply think it’s nothing more than the contrail of an airplane or North Korean ballistic missile. 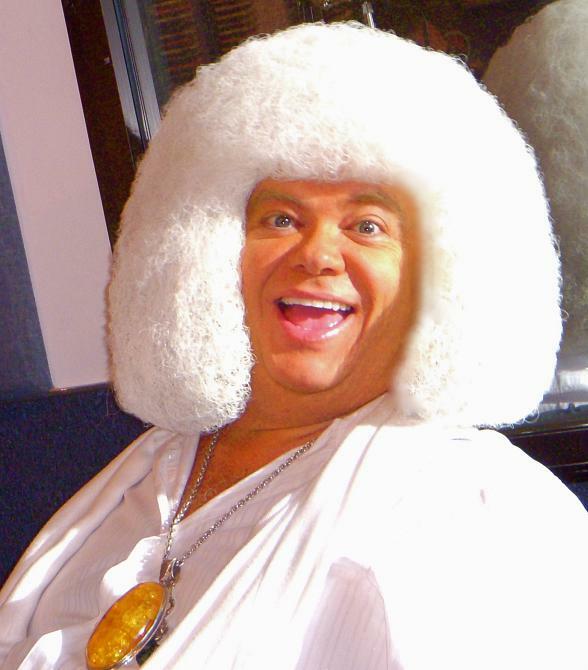 Comet ISON is likely to cause panic in the streets. It will possibly be brighter than the full moon, maybe even bright enough to read by, and it’s tail might fill a decent portion of the night sky. That’s VERY bright and this will be an unforgettable sight. It’s worth noting that this Halley-buster was only discovered last year on 9/21. There’s no way to know for sure exactly how big or bright this comet will appear for sure, but we know it’s going to be pretty damn impressive. I’d tell you to keep an eye out for it next winter, but I seriously doubt you’ll miss it. This has the real possibility to be the brightest comet we see in our depressingly short lifetimes, but who knows, maybe it won’t be as bright as we hope or maybe something even grander will come along. Or maybe we will figure out how to transfer our consciousnesses into machine bodies that are immortal and WE can be the robot overlords. 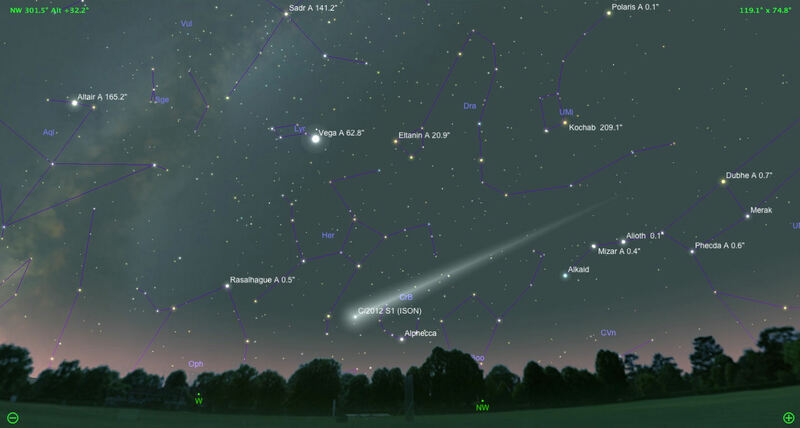 Here’s a pic of Comet Lovejoy the southern hemisphere peeps enjoyed recently. ISON could make even this look meh. *My first made-up word this year! It means “full of comets”. When I was writing this post, I knew there was a third comet to mention for this year, but I couldn’t remember what it was called and there hasn’t been too much written about it, but ONE day after I published this, I found it. Comet Lemmon (c/2012 f6) was discovered last March by the Mt. Lemmon Sky Survey in Arizona and will be visible in Northern Hemisphere skies in April, so we could have another good one this spring. In case you weren’t sure, it will look most like the larger picture on the left. Thanks to the miracle of social media, I saw a post on Sky&Telescope’s FB page indicating a possible impact on Jupiter with a picture taken by an amateur astronomer in TX. This is a single video frame, pressing “play” will not animate anything. Maybe you should try it anyway and check out the photographer’s site though. So, naturally, I woke up very early and took a trip down to my nearby observing site. I wasn’t sure I’d be able to see everything from my yard, and the pre-dawn sky is pretty damn interesting right now. You have a crescent moon, Orion, Venus, Jupiter and a bunch of other cool stuff. My priority target was Jupiter, though I knew that even with my high-quality 80mm scope, high levels of detail would be hard to come by. 80mm is more than some of the greatest Astronomers in history ever used, but it’s about 1/3 the aperture of the scope used to take the picture above. That’s diameter too, not area. CHALLENGE ACCEPTED. I managed to get up early enough that it was still totally dark, but was a little too early for my brain to be 100% working. In my stupor, I forgot my observing chair, which wasn’t the end of the world since I wouldn’t be out that long, and immediately trained my scope on Venus instead of Jupiter. For those of you who haven’t ever put Venus in an eyepiece, let me tell you, that lady is BRIGHT. Venus was crescent too, so that was still pretty cool, just shocking. Fortunately, so is Jupiter and you really don’t need dark adjusted eyes to observe it, nor will you have them once you do. Many amateur astronomers consider Jupiter to be the ideal “last target” of the night, since it does such a number on your night vision. Venus has phases like the moon. Did I mention this thing is BRIGHT? So, after finally targeting Jupiter, which was the first time with this scope, I was surprised at how much detail I could see in the rings. I’m not sure, but I think I may have seen a little dark spot on the northern equatorial belt. The seeing wasn’t perfect, so the focus came and went, but more than once I thought I saw something. I know there aren’t shadows from any of the moons that would cause this, but it was not so distinct that I can say what it was. It’s entirely possible my desire to see something filled in some blanks, so I’ll have to wait and see what follow up information comes up. While I was out there, I got a great look at the Orion Nebula, which was surprisingly good in this scope. I can’t wait to spend some more time with that particular target this winter. Well, after some time, luck, money, time, research, more time and some totally hilarious foibles, I finally have a new telescope. My last one was an 8″ Celestron SCT with computerized “go-to” mount. It was optically very good and the telescope itself wasn’t too heavy, but the mount was (I replaced the one it came with for a heavier duty one), as well as unruly and required power to use, all in addition to a somewhat tedious set up. Everything worked as it should, but I wasn’t using it much because it took too much effort to get everything going. 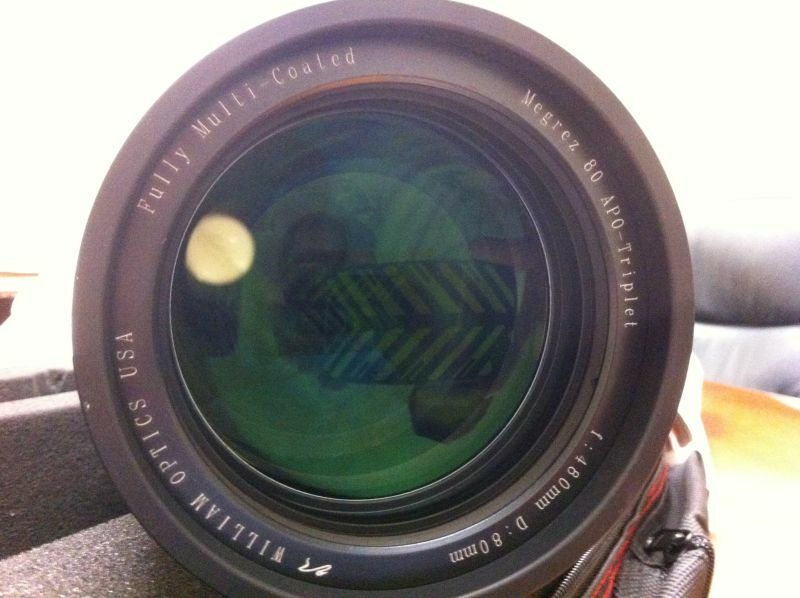 I sold it and wound up getting back almost all my money, which is great, but not unusual for optics and astronomy gear. So, I went with the nice, low-tech approach for this one. I wanted to be able to go out on my back porch and just start observing, which is exactly what this kind of setup is for. This scope was purchased used and I scored UNBELIEVABLY when I bought it. It’s from about 2004 and made by the Taiwanese company William Optics (specifically a William Optics 80mm Megrez LOMO apochromatic triplet refractor, f/6). It’s a refractor with an 80mm objective lens and a “triplet” design, which means it has two more lenses after the objective, which helps bright objects from looking like they have funny colors and is typical of “apo” scopes. High quality internal glass makes this aspect even better and this is where I scored. Unknown to the seller, this one has glass made by a Russian company called LOMO. 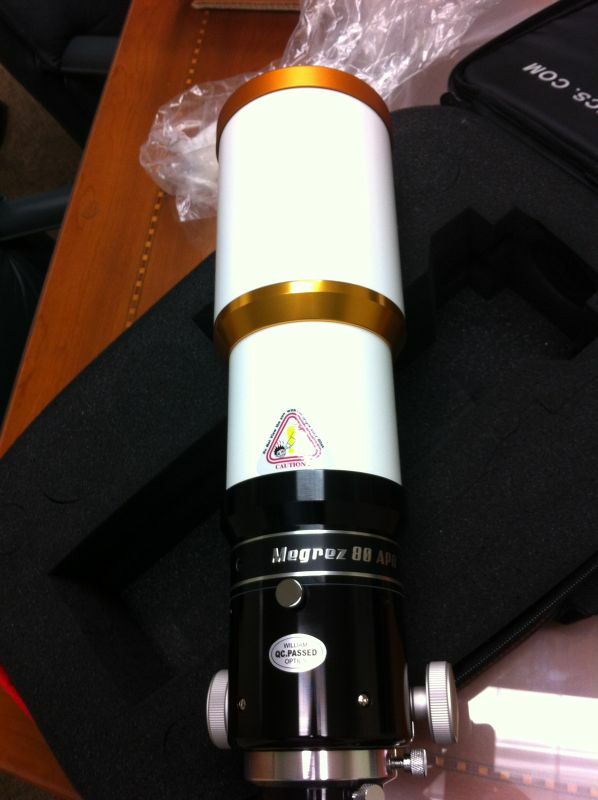 Many amateur astronomers consider these LOMO scopes to be the best 80mm refractors ever made. It wasn’t cheap, but it was about $500 less than it probably should have been and the condition was absolutely pristine. Sorry if that seems like gloating, which isn’t very becoming, but it was an EPIC win. The hilarious warning sticker was an unexpected bonus. I was looking for a William Optics scope not only because they’re high quality instruments, but also often come with these cool backpack cases. Why more makers of scopes don’t do this, I have no idea, it’s great. It all adds to the portability and usability of this scope. 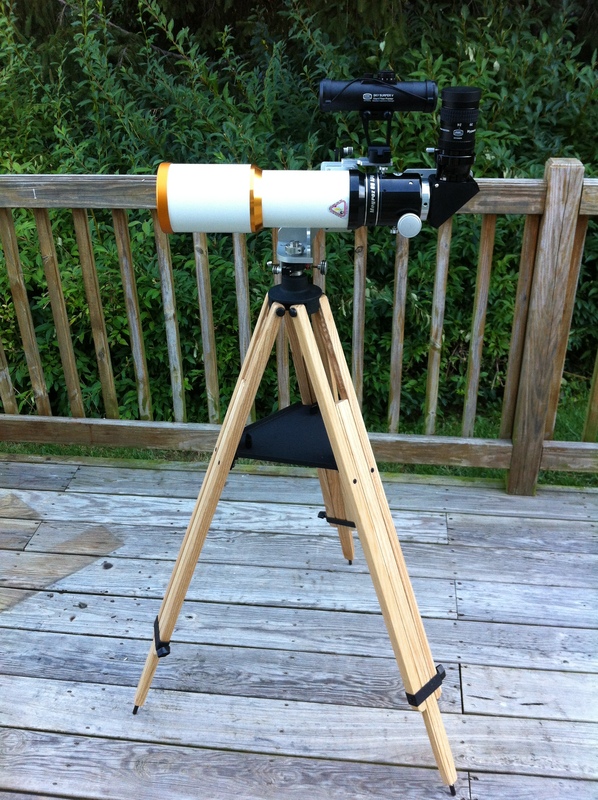 The tripod was ordered from KB Systems, who make the tripods for Televue, lightweight and made of wood (ash). The mount is a lightweight, all aluminum, unit that lets me just point it where I want it. Simple. The opposite of what I had before. “First light” finally came after a bit of waiting. We’d been in the grip of a mild drought (NOTHING like what the midwest was experiencing recently) and had a lot of clear nights, which ended abruptly the day my tripod arrived and provided us with weeks of rain. Sometimes occurrences like this are referred to as the “two week curse”, which amateur astronomers (with a good helping of confirmation bias) know as the period of cloudy or otherwise crappy weather following a new scope’s arrival. BIAS CONFIRMED! The weird looking thing that resembles a black paper towel tube is my finderscope. It’s excessive. The night turned out to be clearer than predicted and seeing was pretty good. My targets were easy things like Alberio and splitting Polaris. Everything worked very well. I even got Neptune (currently at opposition) in my field of view, but it was pretty low in the sky and between some local light pollution and the scope being on the small side, any color was difficult to see.